Chimamanda Ngozi Adichie’s Half of a Yellow Sun is a book with such a broad palette that it is difficult to know where to begin. I put it down feeling enlightened, chastened, saddened and satisfied. Half of a Yellow Sun is both a novel and a history of the conflict in Nigeria in the 1960s with the rise and fall of the infant state of Biafra. It is a tour de force in both fields. The main characters cover the social gamut including educated middle class Nigerian, poor uneducated servant class and lost educated European, they all draw you in to their stories of love and aspiration and eventually the pain of watching their country die. Adichie’s insight into human behaviour, her sharp observations of the many different ways people are foolish are very funny and totally believable. Her passion for the forgotten pain she and her countrymen and women have suffered is palpable. She teaches us (less well informed Europeans), without lecturing, to see beyond our assumptions about Africa (and indeed the lesson we are so slow to learn – that Africa is not a country). She shows us directly and simply and without polemic, the effects of Imperial occupation. If I have made Half of a Yellow Sun sound heavy, I mislead you, it is the reverse. It is absorbing, witty, moving and a cracking good read. This entry was posted in Reading, Writing notes and tagged 1960s, Biafra, Biafran war, Chimamanda Ngozi Adichie, Half of a Yellow Sun, Nigeria, novel by hilarycustancegreen. Bookmark the permalink. I am hoping to read about your Liberian experiences when they are ready. 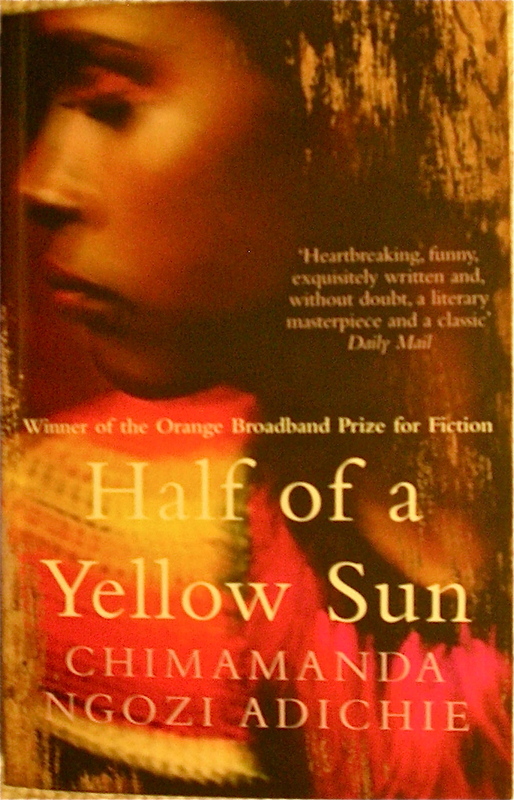 Half of a Yellow Sun received the Orange Prize for fiction. I meant to quote an answer, with appealed to me, that Adichie gave to the question: If you weren’t a writer what job would you do? A professor teaching whimsical, anecdote-filled, anti-establishment courses about which the university administration would have suspicions.